Take a look at the photos below. Here is a look at the bottom of the original Egerton Tall Case clock. What do you see? I see tons of information about how pieces, clocks in particular, were built during the period. While I have come to understand that construction methods used back in the day are questionable when viewed with today’s eyes, I am constantly amazed at what we see. 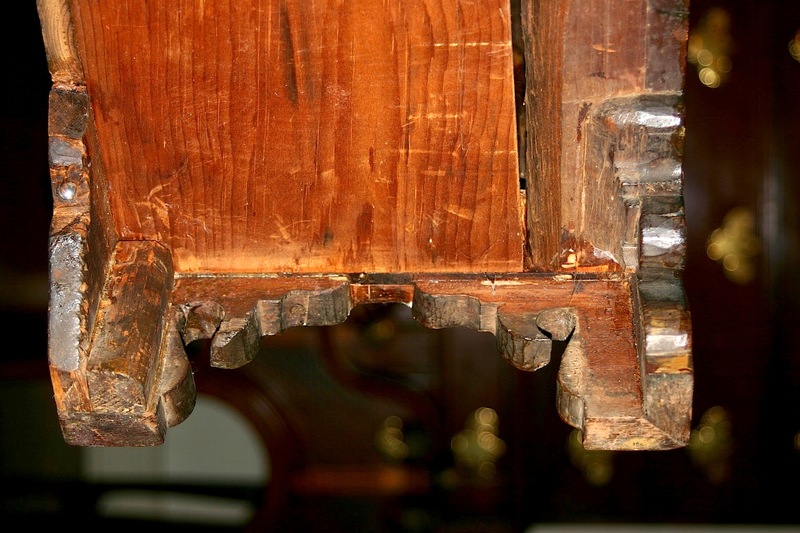 For example, The bracket feet on this clock are attached under the transition molding that wraps the base on three sides – they may just catch the base sides and front, but if they do it’s not by much. Glue blocks, placed at the corners, fit under the case to carry the load. The rear feet in the photos are aligned with the clock’s backboard. Were the feet installed after the back was positioned? Or did the rear feet simply flop in the breeze until the back was added, at which time a nail made the final connection? In the top photo, a missing glue block answers the question of how the feet were joined. The faint over-cut lines on the rear side foot indicate that the rear foot was dovetailed to the side foot. (Front feet are mitered.) If the block were in place, as it is in the second photo, we would be left guessing. Notice, also, how thin the base sides appear. My best determination is that the sides are 1/2″ in thickness. With this information, it is clear that I plan to build an adaptation of this clock, not a reproduction – I don’t see the value in working with stock that thin. Another question is how the bottom is attached. 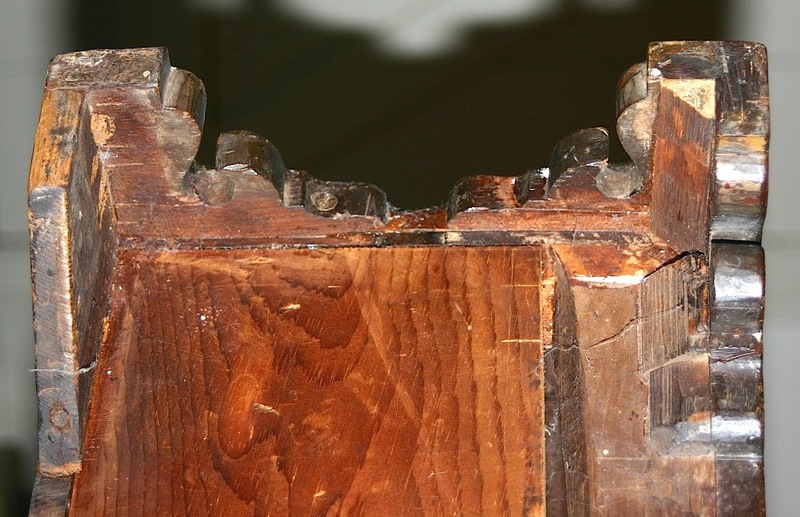 I have photos from other period clocks that show bottoms held in place by glue blocks (see below). That type of construction may seem shoddy, but there is a reason to adapt this method. Sometime during the clock’s life, it is possible that weights, which drive the movements, could be dropped in the case. At 10 – 14 pounds or more, these weights would do severe damage to the case bottoms. 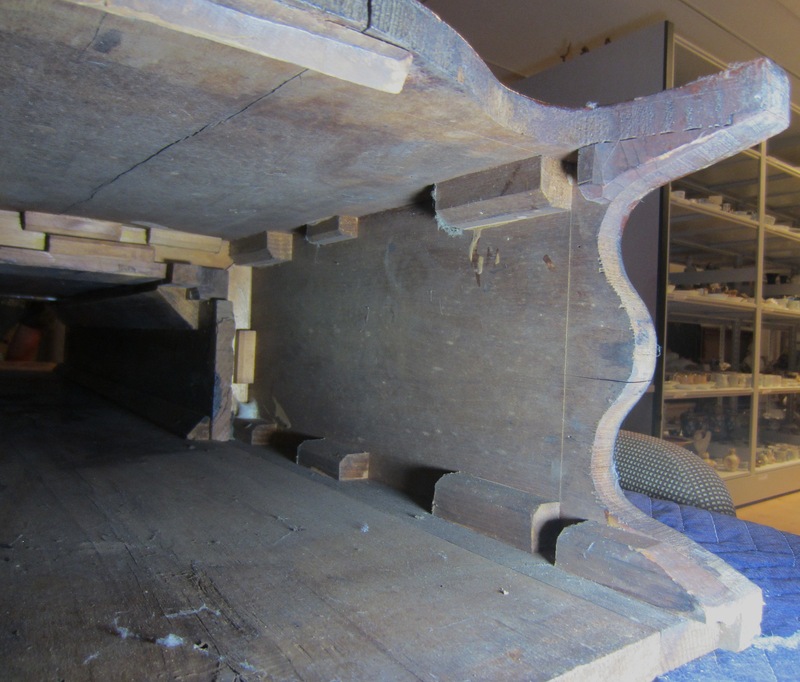 If the bottoms were an integral part of the base, repairs would be difficult if not impossible. Easily replaced bottoms keep the clocks in good repair. I’m sure there is more information shown. If you see something in the two photos, leave a comment below. Information garnered from more than one pair of eyes makes us all better craftsmen.